I’ve watched a lot of Chinese movies as of late. As I dig deep into the second draft of my new novel, a Chinese epic war saga, I wanted to immerse myself in the arts and culture of the Middle Kingdom, so I can add as much of that flavor to the stew of my story. Many of the great Han films of the past few decades are available for a song, a few bucks for a used DVD at most. Due to a loose concept of property values in China, you can even watch many of them for free on YouTube because nobody seems to own the distribution rights. The price of these flicks is in no way equal to their worth. A quick warning: this review contains spoilers. The story covers forty years in the life of a family who endures the madness of red China rising, as well as personal tragedy, the likes of which westerners have never even come close to experiencing. One of the themes of my new book is that nobody does suffering like the Chinese. That theme surges through the heart of this film. 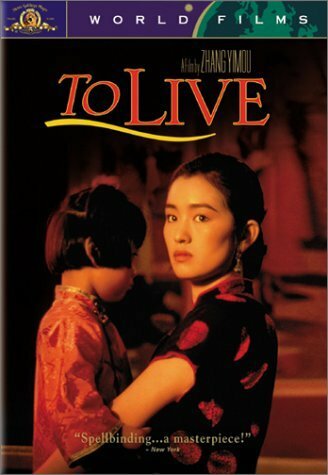 The couple at the center of the story, Xu Fugui, a degenerate gambler and rich landlord, and his wife, Jiazhen, played by the gorgeous Gong Li, endure the loss of everything that people swear they can never lose and still survive: all their money and property; their children; their dignity; their livelihood. And yet they find a way to endure it all and keep on going. “You have to bare it all, no matter what,” is a line repeated by several characters in the film at different points in their lives. And yet this film is not all horror and grim determination. Far from it. More than anything, it’s a hopeful film. In between loss and sadness they continually find a way to rekindle their joy. One child dies, but another is born. A friend is killed, but other friends remain. A job is lost but another one is found. Each tragedy is followed by a tiny triumph. These aren’t the triumphs of the masters of industry, or generals or political elite; these are the triumphs of the everyday person. No matter what happens to them, the couple finds a way to not just survive, but to thrive. They manage, in short, to live. A subtle understanding of the workings of fate pervades the film. In life, tragedy and triumph are often interchangeable. What looks like a triumph can years later become tragedy and vice versa. Early in the film, Xu Fugui loses his house to a corrupt casino owner. The casino owner smugly moves into his mansion, glowing and crowing the whole time. To pile on the hurt, Xu’s father suffers a heart attack as the property is sold and Xu’s wife leaves him. Xu’s own words say it best when he stands in the middle of the street and cries, “I have nothing left.” As I said, nobody does suffering like the Chinese. And yet, losing everything humbles him and turns out to be the best thing that ever happened to him. He endures people mocking him and becomes a small time street salesman of trinkets. He stops gambling. When his wife, Jiazhen, realizes he has changed his ways, she returns to him with a baby son and a baby girl. “What’s the boy’s name?” Xu asks. “Don’t gamble,” says the wife. Of course, the wife is joking with him. The filmmakers are not afraid to hit you over the head with some of the themes, but they are subtle enough to leave it as a joke. For writers out there who want to see tropes at work, this film is a magnificent example of lamp shading, or hanging your theme out there for the audience. The couple reunites and their life is simpler, but closer, more intimate. They are working together as poor people. They work hard and their family holds on. They take pleasure in the simple joys of talking to each other, or taking pride in what they do, no matter how seemingly menial. The film often includes some jarring political events. The war with the Communists breaks out and no one is spared. A series of lucky breaks seems to save the husband. At first he is drafted to fight for the Nationalists, who ultimately lose the war. The hero is not much of a soldier and he just wants to stay alive, as do most people. In the freezing cold, he and some friends loot jackets from the dead and fall asleep. When they wake up, the entire brigade they were embedded with is killed, their bodies strewn across the field. By falling asleep they managed to avoid the communist snipers. When the Reds storm the camp and take them prisoner they are saved by one twist of fate. Puppets. Stay with me and I’ll explain, after just a little background. Remember how we said that tragedies are often blessings in disguise? Earlier in the film, Xu goes to the corrupt casino owner and asks to borrow money to start a shop. Here the casino owner displays the depth of his character and says, “I’m not much for lending money, but I’ll give you something better.” He gifts Xu the puppets from his casino days, since he retired. The puppet shows were like films and TV rolled into one. They used a canvas screen with lights and people behind it. The puppet troop uses the various queens and emperors and concubines to put on a great show. Even the seemingly most useless events of the film turn out as essential to the entire story. In the beginning, drunk and rich, Xu complains that the puppets are terrible. The casino owner says, if you can do better go up there. So Xu goes up and plays, while singing a more ribald song about a man and wife wanting more time to frolic in their big bed, while the puppets caress each other. It’s a funny scene that in the hands of lesser writers would amount to little but character building. I found myself thinking this is a good scene, but ultimately pointless. How delighted I was to see that the one job that saves him through many of his transformations is puppeteer. It’s not just a throw away. Without knowing that he can sing and entertain, even if he is just screwing around, it’s a lot less believable that he could just pick up a puppet troop and make a living. And after they are captured, Xu realizes the Communists like entertainment too. Who doesn’t? So he survives by providing entertainment for the troops. That single gift saved his life. And if he hadn’t treasured it, keeping the puppets with him, even in battle, he would have died. If he’d listened to the people who said why don’t you just get rid of them he would have died. The littlest things can make the biggest difference. From here, the movie builds on its layers with incredible agility. During the madness of the Communist takeover, they consolidate power. They arrest landowners and elite and try them as capitalist scum. And in Xu’s hometown, who gets arrested? The rich casino owner does. He is declared a traitor while the people chant and he is taken out and shot publicly. Xu realizes that, “if I had still owned that house, that would have been me.” His early tragedy becomes his greatest blessing. I’ve always said that Chinese filmmakers have incredible subtlety, something American filmmakers often lack, even in our best films. There’s a reason for this though. They have to be. Their movies have to go through censors. They can only tell stories about specific subjects. The films can’t critique the party. If the film falls foul of the party later, as To Live did, the filmmakers could end of up jail. In To Live director Zhang Yimou‘s case he got lucky. The Communists only banned him from making films for two years. His film got through the censors, but only later did the party realize how much of the film mocked them subtly, while purporting to portray the communist cause. Yimou does this by really overplaying the communist scenes to make them seem absurd. To the thick headed censors they saw themselves proudly in the Red Guards and the marching townspeople and the propaganda posts of Chairman Mao plastered all over everything. They just didn’t realize everyone else would see them as baboons until after it came out and the critics spotted it. The critique of communism roils just beneath the surface of the film. The Great Leap Forward and the Cultural Revolution were terrifying times in the life of China. In essence, Mao went mad and built a cult around himself. He tried massive social experiments to see if communism really was practical. His posters plastered the walls of every house. His young adherents, the Red Guards, who were mostly angry, disaffected youth stormed around the country accusing the elderly of being reactionaries or bourgeois or elitists or capitalists and killed them or abused them. Millions of city people were, “reducated” by being sent to subsistence communal farms to work. The costs were dear, with millions of people dying just of starvation. In one of the most devastating scenes in the film, the couple’s daughter dies because all the student nurses and doctors in the hospital have “overthrown” the real doctors as “reactionaries.” When the girl starts to bleed out after giving birth, none of them know what to do. Their vision of a utopian future falls apart in the moment. You can’t kill all the doctors without heavy consequences for society. The greatest error we can make as humans is to think that we can create some better future where all the people think the way we do. Communism is a kind of faith. And any faith taken to its extreme never goes well for the little people. Always the Utopia is somehow just around the corner, but it never comes. And so more people have to die. More and more people have to be killed so that Utopia can finally take place. But Utopia never comes. That’s the mistake the Communists and all messianic faiths miss. Their dream never works out, because life is more complicated. During the Great Leap Forward people were told to donate all their steel and iron, their pots, their pans, everything. They worked in communes, smelting that steel under insanely unsafe conditions, all for the war effort against Taiwan, that ultimately the commies didn’t win. Even worse, the smelted metal turned out to be largely worthless. Its quality, made by inexperienced laborers, from broken down, poorly made tools never ended up in most cannons, as Mao intended. It ended up in the landfill. In one of my favorite scenes in the film, Jiazhen asks the village leader, a true believing communist idealist, “if you take all our pots, how will we cook?” He smiles happily and says, “We’re racing towards communism and you worry about food?” Communal kitchens are being set up. They’ll provide perfectly for all. Except of course, in reality, it never worked out that way. People staved or ate nothing but rancid vegetables. The film also manages to mock Mao beautifully. At one point the only gift that anyone seems to give are Chairman Mao portraits. The walls of everyone’s houses are covered with them, because it’s the only safe gift to give, so people don’t get branded as counterrevolutionaries. When Jiazhen refuses the gift of an old friend who’d wronged the family, her husband Xu says, you don’t want the gift? Look, it’s Chairman Mao. Yet, another one. The critique of Mao and his policies delivers one of the most striking scenes in the movie. That same local party leader, the true believer, learns a lesson the hard way. I read a military book recently, about fighting in Asia, and the author wrote, “they say the only cadre who realizes Communism is a mistake, is the one who realizes it too late.” Anyone can be accused of being false to the imagined ideals of the Communists. The true believing cadre says to his friend Xu, “I’m no longer village leader. I’ve been charged as a capitalist.” “You a capitalist? What will happen to you?” “Let’s not talk about that.” We know what happens to him. He’s killed. That’s the madness of political ideals taken to an extreme. Eventually, when you’re looking for snakes, all you see are snakes. Even your most loyal members start looking like traitors. The ever-hopeful cadre says, “don’t worry, I believe in the Party.” Beliefs can kill. Eventually though, the madness of Mao subsides. Paintings of him are taken down. An old painted mural on their walls is faded and corroded. Mao is dead, his inner circle arrested. The film ends with the dawn of the great awakening, when Deng Xiaoping, perhaps China’s greatest leader and a man who spent time in prison because of Mao’s purity purges, loosens up the concept of Communism to take advantage of the markets. His reforms lead to what China is today, a country defined by the Party as “socialism with Chinese characteristics” aka “fat cat capitalism.” Crony capitalism. Gangster capitalism, where the strong prey on the weak, and the divide between the haves and the have nots is a chasm, not a gap. And somehow, as humans, people manage to live through the madness of all our leaders and their great causes. As the film shows, we all find a way to get back up and live again when things go wrong. It’s not easy, but it’s the only thing we can do.